This week I had so much going on and became overwhelmed with a lot of stress. The problem is I allowed it to effect me and bring me down too many times this week. No matter how hard I tried, I had moments I just couldn't control the frustration I was feeling, and I allowed it to effect me and I had a negative attitude quite a bit this week. I missed a lunch workout due to work, and Saturday I chose not to go to the morning group workout. I was so exhausted mentally and physically, and I'm guessing it was just all the stress got to me. But, I am happy to be able to say I lost 1.4 this week! Which means, as usual, trusting Michael and the process really does work! I do feel like had I not allowed the stress to control me like I did, that I might have even done a little better. But, I'm definitely not going to complain, down is down! And, it also means, in the past three weeks since making these new changes I've lost 9 pounds! I can't be anything but happy about that! Now, I can't go into details on my blog about exactly some of the things that have happened this week, but do want to mention something that I feel is important. Typically when I'm talking about struggling in a "weigh-in update" post, it's because I'm not seeing the results I want on the scale. But, this time I'm talking about facing the every day struggles we each have in our own personal lives. 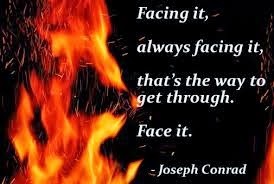 When I saw this quote, it made me think about some of the things I faced this week. And what was even more ironic, is just minutes before I started looking for a quote for this post, I had just sent a message to Michael about my weigh in and was telling him about one of the things I'm struggling with. I told him I realized when I start to struggle it's just easier to not face it. By not talking about it, or facing it, then I don't have to deal with it. But, just like anything else that is important, we have to find time for it. We all have our own struggles, and regardless of what they are, just like health/fitness we can't give up when it becomes difficult. So, whatever your personal struggles are, don't give up! Make sure to face the struggles, work through them, and in the end you'll feel better mentally, emotionally, and physically.